A racially charged incident occurred at American University just hours after a presentation about the campus's vision for an Antiracist Research and Policy Center. WASHINGTON — The president of American University said surveillance video captures someone coming on campus and posting Confederate flag posters and cotton on bulletin boards in at least four buildings on Tuesday night. Ten Confederate flag posters, each with a stalk of cotton attached, were found in four locations on campus, according to the university. The school’s new president, Sylvia Burwell, hosted a community discussion with faculty and staff at the Kay Spiritual Center on campus Wednesday, where students expressed concerns for their safety. “It’s not just the black students’ responsibility. It’s not just the LGBTQA students’ responsibility. It’s all of our responsibility. Because we all invest our time and resources in this place,” one student said in reference to how the school community should respond to the incident. She was one of many students concerned the suspect could walk onto campus undetected and post the hateful posters in multiple buildings. “They’re concerned about their safety. They’re concerned with campus climate. They’re concerned with the state of our campus community,” said student president Taylor Dumpson, who was the target of a racist attack on campus last semester. The racist symbols were posted the same night a presentation introducing AU’s Antiracist Research and Policy Center occurred. The presentation was headed by Ibram X. Kendi, a new professor of history and international relations at AU, who discussed his vision for the center. Burwell said campus police are investigating the incident. “Video evidence shows the perpetrator(s) coming on to the campus and hanging the posters on bulletin boards, among other locations, in at least four buildings on campus,” Burwell said in statement. The man is believed to be a white male, approximately 40 years old. 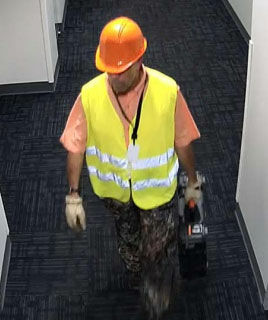 According to police, he is approximately 5 feet 10 inches tall, wearing a pink shirt, an orange hard hat, camouflage pants, and off-white gloves. Student Max Spivak attended Kendi’s “History of Racism” class Tuesday night. He and classmates found the signs on Israel studies and African-American studies bulletin boards. 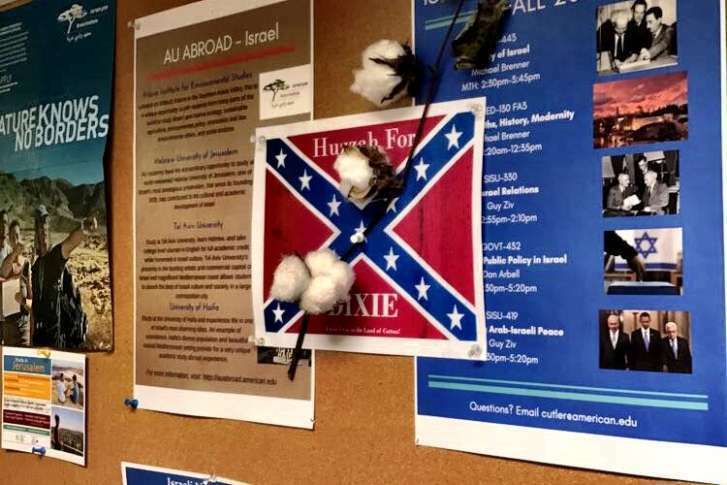 Images of the Confederate flag posters were displayed in Black Print, a student news source created by the AU Association of Black Journalists. While investigators try to determine who posted the signs, Spivak said the intended message was clear. “When you think of the Confederacy, and when you think of cotton, you think of slavery,” Spivak said. This incident is the most recent in a string of racist symbols found on campus. In May 2017, bananas were found hanging from rope tied in the shape of nooses in three locations on the campus in Northwest D.C. Hours after his presentation, Kendi tweeted words of encouragement to AU students. American University isn’t the only school grappling with racist incidents and hate crimes. In August, students from the University of Maryland told WTOP about fears for their safety following the fatal stabbing of Richard Collins III, a Bowie State University student, near a bus stop. Just a week after a white nationalist rally turned deadly in Charlottesville, University of Virginia students began moving back into their dorms. The racial tension has led administrators at some colleges to rethink safety procedures. Last night’s incident at American will not interfere with the establishment of the anti-racist research center, said Fanta Aw, the university’s vice president of campus life, in a statement. “AU is committed to the vision of the Center and Dr. Kendi’s work, and we will not be deterred by this cowardly attempt at intimidation,” Aw said. Anyone with information about the incident is urged to call campus public safety at 202-885-2527.